Did I really open up this can of worms? Yes, I did because it’s worth it. I want to share a personal story in regards to immunizations. We are going a few years back to when Kody and I were expecting our first son Karson. We were very proactive parents from the get-go and believe in healthcare. There were many prenatal care visits, but one that stands out was our appointment with the Maternity Care Coordinator. There was a vast amount of paperwork to fill out regarding important decisions making: legal names, birth plan and, well, immunizations. The Maternity Care Coordinator was going over the various immunizations given at birth. There was one mentioned that was presented as optional at birth. 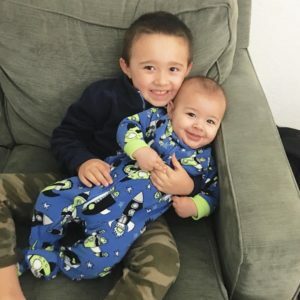 Before I truly processed the benefits and risk I voiced that I wanted to wait until we met with our pediatrician a few days after birth to receive the final vaccines. I justified it with the, “well my baby is so little and they will get it later.” I had read so much information around pregnancy but the immunization conversation was new. Soon thereafter, upon reflection, Kody and I preferred to get every single vaccine possible at the time of birth. While researching I learned about herd immunity and other important points that just make sense. You never know if your child will be exposed to something that they are too vulnerable to fight. As a mom I really took it to heart to make the best decisions possible for my little baby. I believe that vaccines save lives. We often have the luxury of living without some horrific epidemic experiences. I was born in the 90s and by then polio vaccines were well established. Polio in the United States was history. The vaccines a baby gets may seem overwhelming but if you understand the history and the end goal of wellness, it makes it a sealed deal. I am extremely thankful for the medical advances that we have today. To have that much protection through vaccines is truly incredible. Because of vaccines, my two boys have a much better chance of growing up without certain disease and illness. I grew up going to the doctor when there was a problem. Wellness checks and disease prevention visits are definitely a new experience to me. I am very grateful that healthcare has advanced and we are getting closer to prevention versus the after fact care. Remember to keep up on those very important wellness checks. I like to schedule appointments in advanced before developmental milestones or birthdays. Since my oldest son is in K-12 I call his pediatricians office to verify that he is on track with his immunizations. Upon entering Kindergarten children should have had another round of immunizations. Schools have lots of children and the human to human interaction for each child heightens making immunizations imperative. I hope we can all agree of how neat it is to live in a time that healthcare is more available and accessible that it ever was. Having a better chance at living a healthy life due to medical advances is heart stirring in a good way.